These days, the Coushatta are the exclusive American distributor of Aya Natural, an Israeli startup skincare company, and Sickey recently participated in the Southwest Louisiana Economic Development Alliance’s trade mission to Israel, led by Louisiana Senator Mary Landrieu. Though ties between the Coushatta and the State of Israel have taken on an economic tone, the partnership is ultimately rooted in a shared appreciation for and commitment to nationhood, sovereignty and self-determination. Though the Coushatta do practice Christianity, Sickey said that religion was not a factor in his attraction to Israel. Historical parallels between the Coushatta and Jewish experiences were also a crucial push factor. Originally encountered by Spanish explorer Hernando de Soto in the sixteenth century, the tribe was forced to relocate from present-day Georgia and Alabama to southwestern Louisiana due to pressure from colonial settlements. Their reservation sits on 685 acres of prairie and forests in the heart of oil and gas country neighboring Acadiana. The federal government officially recognized the Coushatta in 1973, and today the members of the tribe’s seven remaining clans number 879. “When we first pitched the idea to the council, the issue was what do the Coushatta and the nation of Israel have in common, but once we began to look into it, we found similar stories about the plight of Native Americans and the Jewish people, the search for homelands, banishment from our homelands, adversity and persecution,” Sickey explained. “We both also have modern-day challenges of security and land rights.”Comment: As I've noted before, many Indians sympathize with the Palestinians, not the state of Israel. You know, because Israel stole the Palestinians' land and keeps them subservient in reservation-like areas. For more on Israel, see Palestinians and Indians "Invented"? and Gaza = "Largest Indian Reserve." 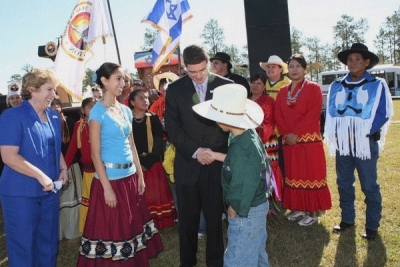 Below: "Coushatta tribesmen meet with an Israeli delegation."